Internet Service Providers or ISP in short provides the internet connectivity to us. Not all ISPs offer same kind of speed and quality of service. Sometime they block and limit internet connections without customer’s knowledge. As a result of this traffic shaping policies you may experience slow download and upload speed, inability to use torrent, bad flash video experience etc. If you are facing any of the problems mentioned above then it’s time to test your internet connection and find out the real reason behind it. Glasnost test finds out the real reason behind poor internet experience and checks whether ISP is limiting anything or not. 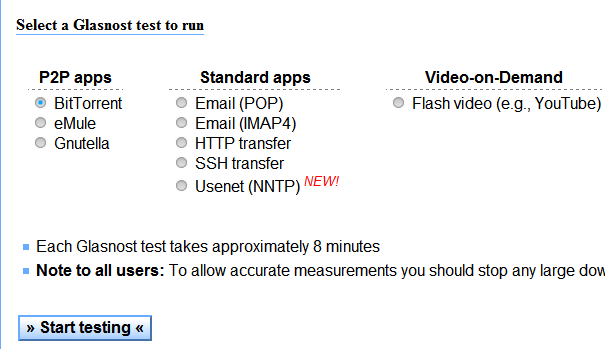 There are mainly three types of tests P2P Test which tests Peep to Peer connections like Bit-torrent transfer, Standard apps which tests HTTP transfer, SSH transfer, Email protocols etc and finally Video-on-Demand tests which performs Flash video streaming test. These total 9 types of tests help to find out internet connection limitations set by ISP. It may take up to 8-10 minutes to complete each internet tests. To get most accurate test results don’t keep any download active while running the tests.After performing all tests you will get to know about ISP’s traffic shaping policies to limit internet connection.